Here is the first update of October for you! Its here! Our 4th annual Canada's Choice portion of Canada's Top Travel Rewards Credit Cards is back. Cast your vote now for your favourite cards. In the bonus offers section check out the new offer for TD Aeroplan Visa card holders. You can earn 3 to 5x the Aeroplan Miles on all your eligible Air Canada purchases. If you buy international business class you should see your account grow quickly! 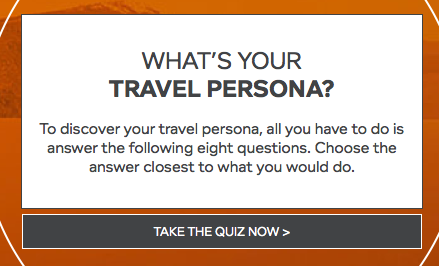 Aeroplan has also launched a new quiz where you can discover your Travel Persona. Eight simple questions to answer. Take the quiz here. 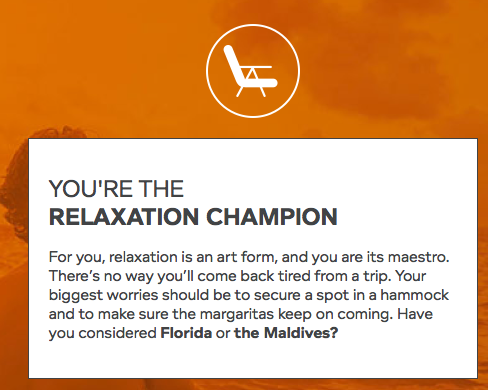 I'm a relaxation champion!